Distribution: North central and southeastern Iran, western Afghanistan, northwestern Pakistan and the eastern Arabian peninsula. Habitat: Restricted to desert regions with sparse plant cover. Brief description: SVL of 115 mm and a total length of 175 mm. 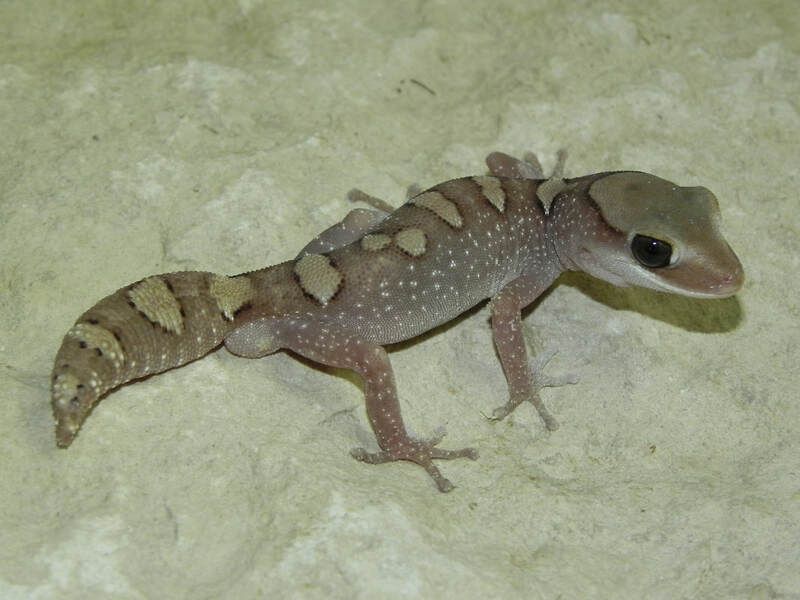 Bright yellow and orange coloration with two black stripes running down the back, make this gecko very appealing. Can be aggressive at times, but makes a hardy captive. Requires a 2 to 3 month cooling period. Mainly insectivorous. Habitat: Wind-blown sands of the coast and the desert. Brief description: SVL of 7.5 cm for females and SVL of 6.5 for males. Total length can be up to 11 cm for females with males being smaller. Pattern and color is varied with each indivdual. Needs a sharp drop in temps at night and sprayed lightly 2-3 times per week. Females lay 4-7 clutches in a season. Insectivorous. Habitat: Sand flats, dunes, gravel washouts and plains. Utilizes burrows and rock retreats. ​Brief description: SVL 11-13cm for males and SVL 80-95 for females. Males are distinguished by size and large white spots on both flanks. Color can vary from brown to red to hypo red. Pairs can be kept together in a desert vivarium. Mainly insectivorous. Habitat: Semi-desert and succulent karroid veld. Occurs in rock outcrops, cracks, and loose bark of dead trees. Brief description: SVL 45-60mm with a total length of 95mm. Probably one of the most sought after African species of geckos. With large rough tubercles, a distinct pattern, and a scorpion mimic behavior, they have their place in one's collection. Can be kept in either a shoe box setup or a small desert vivarium. A hot spot of 90f during the day is a must with a night time drop into the 70's. They should be sprayed down 2-3 times per week. Will accept small crickets, roaches, and waxworms. Should be supplemented with good calcium and vitamins. Females will lay anywhere from 4-8 clutches per season. Fresh hatchlings have a striking bold pattern. Habitat: Sandy, well drained soil, rock mixture and frequently utilizes plants as refuges and observation post's. Brief description: SVL of 55 mm and a total length of 115 mm. Males are slightly larger than females. Tails are bright yellow underneath and serve as a communication device, as they tail-wave and arch in over their backs. Several females can be kept with one male in a large desert vivarium. Insectivorous. ​Distribution: Ryukyu Islands. Isle Aka Ie, Tokashiki, and Tonaki. Habitat: Inhabits rocky terrain along small streams with dense subtropical forest. Hides underneath rocks, dead wood, and leaf litter. Brief description: SVL 84mm with a total length of 160mm. Body color is a dark purple/black with bright peach to pink to orange-red bands and spots. A work of art for the natural world! Can be kept as pairs or trios in a terrestrial vivarium with plants and cork flats. Must be kept below 80F for long term captivity. Will consume small insects and do not give any supplements that contain D3. Females will lay 2-4 clutches per season. Habitat: Humid sub tropical forest. Hides in caves, limestone cracks, logs, leaf litter, and rocks. Brief description: SVL 85 mm with a total length of 165 mm. A large terrestrial gecko with a deep black/purple body color with bright pink/tangerine bands on dorsal. Very secretive and their vivarium should reflect dense plants and hides. Pairs can be kept together. Distribution: From Western Australia to all the arid parts of mainland states, execpt Victoria. Habitat: Arid and semiarid habitats. Open woodland, arid scrub land to spinifex covered desert sandplains and dunes. Brief description: SVL of 10 cm with a total length of 14-15 cm. A very hardy and chunky desert gecko. Always a favorite with gecko keepers. After a two month cooling, females will produce several clutches. Babies are little butterballs! Primarily insectivorous, but will take pink mice. Habitat: Arid open areas. Heavy to stony soil in shrublands and Acacia woodlands. They live in burrows that are dug by themselves or abandoned. Brief description: SVL 90 cm. Small slender tail with a beautiful red color for the body and a classical dark longitude stripe. ​Pairs can be kept together in a rack system on several inches of play sand. They need a good hide and a damp micro environment. Feed common insects that are available with good supplements. Females will lay 3-5 clutches per season. Habitat: Rocky hills, outcrops, Sandy heaths in arid to dry open forest. Uses burrows, metal piles, dead wood and flat rocks for retreats. ​Brief description: SVL of 10 to 11 cm. Black body color with various lighter bands. A uniques feature is purple eyes! Impressive! Pairs can be kept in a rack system on dry substrate with a local hide that is damp inside. Voracious feeders on dubia roaches and crickets. Use good supplements. Females will lay 2-4 clutches per season. Distribution: Australia, NSW, to Southern Australia, to Northern Territory, to Queensland. Habitat: Loamy sandy soils, that have sparse ground cover such as shrubs and dead wood. Brief description: SVL of 50mm with a total length of 80-90mm. A small member of the Genus. Body color is a light cream/grey with orange/red blotches on the dorsum. Males are somewhat smaller than females. During the breeding season, they are very vocal and display a lot of back arching and tail waving. Females produce 3-5 clutches per season, if well fed. Once common, but now it is becoming hard to find. May be setup as individuals in shoe boxes with a sand/stone mixture and a hide box. Temps should range between 80-90f during the day a nightime drop of 15-20 degree's. Offer small insects and feed often. Habitat: Deep crevices in open ranges. Rock outcrops, metal piles, dead wood, and burrows. Brief description: SVL 55mm. A small beautiful terrestrial species. Body color varies but usually is a bright orange/tan with yellow saddles and spots. Can be set up as pairs in a rack system on sand and gravel. Place a few hides and have a hot spot of 95F. ​Feed small various items 3-4 times per week. Use good calcium supplement. Females will lay 2-5 clutches per season. Distribution: SE Australia, adjacent to NSW and Victoria. Habitat: Semi arid using rocks, leaf litter, dead trees and bark for hiding. ​Brief description: SVL 65mm. Grey body with various spots and dorsal stripe. Can be kept as pairs or trios in a desert vivarium. Each female will lay 2-3 clutches. Habitat: Arid areas utilizing rocks, tin, garbage, and dead wood for refuge. Brief description: SVL 65-75mm. Body is grey/brown with small spots and an irregular lateral zig zag stripe. ​Pairs can be kept together and diet must vary for long term. females lay 3-4 clutches per season. Habitat: Arid regions and using various shelters within their habitat. Brief Description: SVL 70-75mm. Body is brown/grey with a lateral lighter stripe bordered by two black stripes. Pairs can be kept together in an arid desert vivarium. Diet and moisture must be monitored for long term. Habitat: Open and closed forest. Lives in burrows, under logs, brush, and rocks. Prefers dry well-drained soil with suitable humid microclimates. ​Brief description: Average 20-22 cm total length. A large body gecko with a clear yellow chevron collar and bands on the dorsum. They can be kept as pairs or haram groups of 14. Females lay three clutches per season and the babies are large and boldly patterned. They prefer insects but will take small mice too. Habitat: sub-tropical to mainly tropical forest to savanna type habitat. Lives in burrows, rock outcrops, logs, and dead vegetation. ​Brief description: Around 40-42 cm total length. A beautiful gecko with a light yellow base body with deep purple spots and variegated bands. Primarily insectivorous. Pairs or trios can be kept together and females produce three cutches per season. Still uncommon in collections.